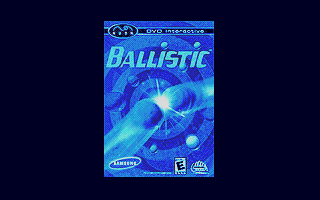 Graphics - Ballistic's graphics look like... Well, a Playstation game. game for the system, and it originally being a Playstation game. they suit the game very well. classics, like Columns, which break new ground and live forever. provided for many intense rounds of fun. being too terribly original, like Ballistic. Ballistic is the exciting new action puzzle game everyone's talking about! dissapear. Combine multiple chains for even more points! * - Stage: Clear a stage, then move on to the next. * - VS: Duke it out with another player on split-screen. * 3 Challenging levels of difficulty! * Addictive fun for the whole family! addicting puzzler but is not without its flaws. maniacally to achieve the high score. gains speed as you make more and more matches and eliminate more balls. This mode gets hectic very fast, but is a ton of fun. the entire string, you move onto the next stage. Vs. mode is half as addicting as Bust-A-Move I'd consider it a winner. slowdown just kills the whole panic effect. Generic Reggae music bumps along as you play, though the quality varies. just irks me, doesn't seem right. Poor, low-resolution graphics and slowdown are no help in this department. Next time optimize the game for NUON please. This is Ballistic's strong point. Fun, addicting puzzling at it's best. it might as well be of a quality game. obvious this could be done on a system much less powerful that even it. that hasn't been done before, and done better. carefully, you can set up chain combos that result in larger point totals. for this kind of game. long run, a good thing for NUON owners. Playstation games easily portable to NUON, and this is a product of that.